ok, first keep in mind I didn't tune it at the dyno. I was only there for a baseline run b4 I started tuning in earnest. I got: 279rwhp/332rwtq. this was done on a Mustang 750 dyno. air fuel ratio was about a full point rich and timing was at stock levels in the upper rpm. it makes 300tq or more for nearly the entire run and starts over 280tq at 2k rpm. i'm pretty sure there's 20hp or so left in it just un the tune. add another 20 plus for LT headers and we're talkin. kewl...can't wait to see what she does after you tuner her!!! yeah same hear i think you will brake 300. Wow the torque really comes on quick! I love that. How much potential HP/TQ does a N/A 5.4 have? I'm probably way off on my observation and I'm sure you guys will correct me, but as far as peak numbers are concerned is there really that much difference between a built 4.6 4v and built 5.4 2v? I know peak numbers don't tell the whole story, but I'm just curious. the 5.4 2v can realistically in streetable trim hit 360rwhp/tq but that's closing in on about it. After that there's just no flow left in the heads. Reasonable street setups with longtube headers should have little trouble seeing 320rwhp and a little more tq. not having longtubes kills the hp on 2v motors. If you want over about 340-350hp/tq then it's time to go 3v which should be good for up to 400rwhp with a little less tq. 4v motors can easily climb up to 450hp and 380tq but as you might imagine low end tq suffers as upper RPM HP increases. Al Papito made like 540hp in his 5.4L 4v and it jerked the wheels off the ground every time so there is plenty of room for play left in the 5.4 block. TQ curves will vary by setup but they'll always start pretty strong compared to a 4.6. A really well done NA 4v could easily do the HP numbers a 2v 5.4 does but for TQ... not a chance. It's just not possible thanks to the shorter stroke on the 4.6. We've only begun to scratch the surface of what's possible on the 5.4 and that's a damned shame. If people wouldn't have stuck their heads in the sand years ago there would have been all kinds of testing and development done already and we'd be talking about how MM&FF only does 5.4 articles instead of how MM&FF only does blower cars (that's kinda a joke but not totally). Back in late october I picked up a MM&FF in the Atlanta airport and saw the article you wrote to MM&FF regarding the 5.4. I agree they should give the 5.4 a little more attention. 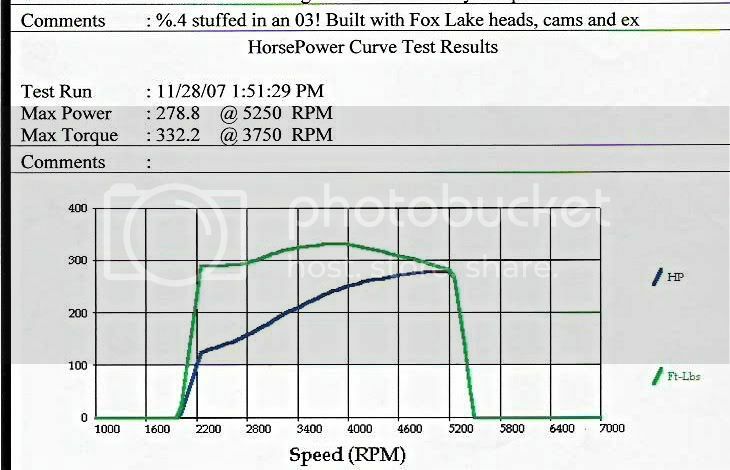 Thanks for the info......that helps me understand a little bit more about the 5.4 engine. I'm going to hook up my new DynoTune Nitrous AF gauge today. Then I'm going to play at trimming out the fuel delivery a bit, put in my 32's and fix a minor coolant leak that's developed in one of my pipe fitting connections. If I'm still not putting longtubes in next weekend then I'll get another dyno run done. Is the 05 GT the best baseline GT ever??? ?